The building in the center is the Pentagon where I worked in the AG Section. Across the road, to the right, is our PX. In the right corner behind the Pentagon is the Service Club. To the left of the Pentagon is our church. To the left of the church across the street, counting from the first hut, mine was the third one. 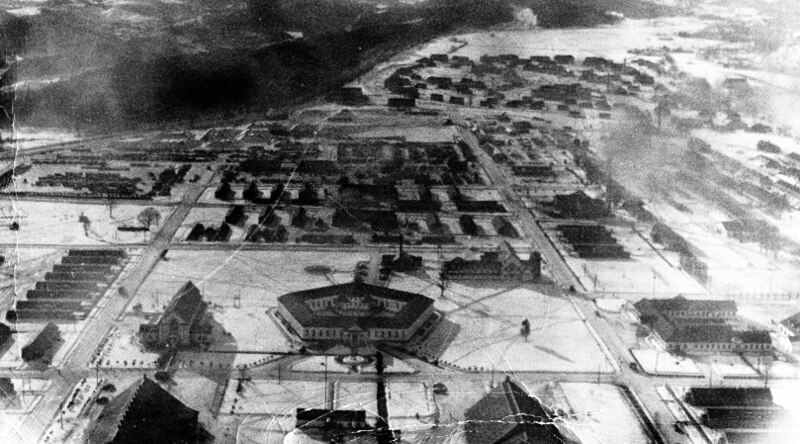 The big building at the bottom left, which only shows the roof, is our theater, and the little building to its right is the Far East Radio Network radio station, and the other large building on the right of the radio station is the field house. This photo was given to me just before I left for Camp Sendai. See slightly larger picture. Here.